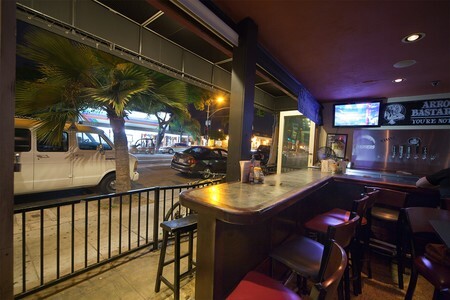 SD Tap Room sits on Garnet Avenue amongst an array of restaurants, bars and shops in the heart of Pacific Beach. SD Tap Room is well known for its wide selection of beers from local breweries including Stone, Lost Abbey, Green Flash and Karl Strauss. Offering the perfect solution to cleanse the palate between beers, munch on Beer Soakers-- fresh pizza dough topped with parmesan, oregano, fresh mozzarella and garlic served with marinara or ranch. With so much beer to choose from, any beer enthusiast will be content to sample Tap Room's satisfying brews. Tap Into Some Tasty Brews and Bites! Locally-crafted, high-quality brews can be found in only one establishment: the SD Tap Room in Pacific Beach. On the corner of Garnet and Fanuel St., Tap Room serves local, premium craft beers and a fresh Mediterranean-inspired menu. 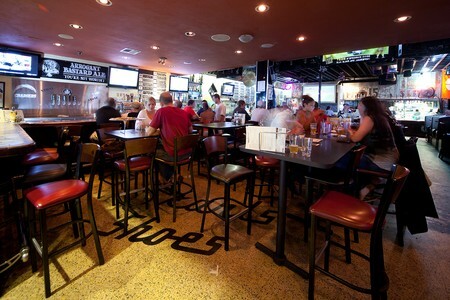 Open since 2007, the bar boasts over 30 local beers on tap and a large selection of specialty bottled beers. 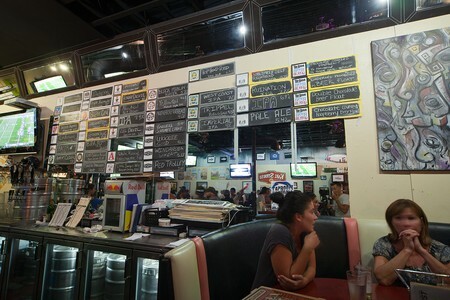 The Tap Room has carved out a niche for itself in the Pacific Beach community. 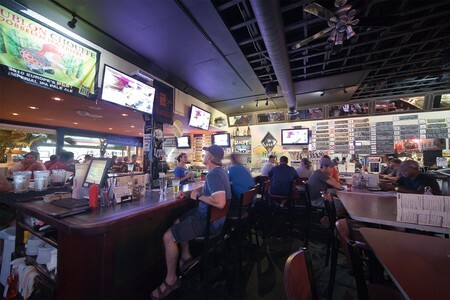 It has a unique and familiar vibe, where you can relax, watch sports, and sip on some of the world’s finest beers. The Tap Room has distinguished itself by focusing primarily on the beer it serves. The largest portions of their taps come from local breweries and features well beyond the standard brews, pouring seasonal and special releases. In addition, the bar specializes in serving IPAs. India Pale Ales are one of the styles of beer that initially made San Diego one of the premier craft brewing cities. The aggressively hopped and bitter beers are a distinct style, made popular by Stone Brewing Co. and offered by almost every brewery in San Diego. Other styles of beer like tart Belgian ales and hearty dark porters are also well represented. The Tap Room’s large sliding doors open up the restaurant to Garnet Ave., allowing the late summer breeze and early afternoon sun to flow naturally between the tables. Ample seating presents the opportunity to pick from booths, bar seating, and high-top seating. Opting for a table, my dining partner and I settle in for a relaxing afternoon with quality beer and good eats. The environment is relaxed with casual bar decor. 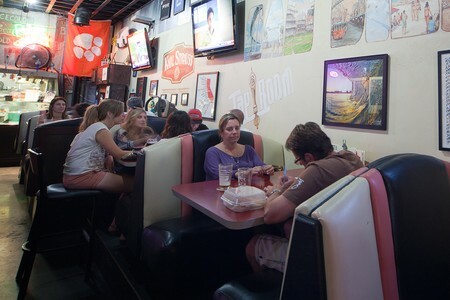 Numerous TVs line the walls showing everything from football to soccer with brewery logos and Tap Room t-shirt designs to break the pattern. The large, natural wood horseshoe bar fills the bulk of the floor space and almost consumes the east wall. Taps are spaced throughout the bar and provide plenty of action, seeming to flow endlessly. Tables surround the bar and I can imagine an animated weekend night. High ceilings open up the room and give the impression of ample space. The walls also feature art by several local artists, a reminder of their commitment to local artists and musicians. Each month the Tap Room holds an event that promotes the creative talents of artists and brewers in an energetic public forum. Two large chalkboards are prominently displayed behind the bar with all of the daily beer selections calling to be read and re-read as you sip your beer. The darker selections catch my eye on this day and I ask the bartender for a tasting flight menu. The tasting flight allows bar goers to choose from any of the taps and have a 6 oz. portion of their selection. You can create a custom tasting menu of up to six beers starting at $2.50 a glass. For those that don’t care for beer or fancy something different, the Tap Room has a limited selection of wines and a full choosing of spirits. A selection of red and white wines exclusively from California is available by the glass and bottle with each major varietal represented. Cocktails and shots are also offered on the menu. While there are no house specialties, the bartenders seem eager to mix up your favorite concoction. However, the bar does get creative with their taps, providing special lambics and ciders on tap. These sweeter varieties do not have the typical hoppy bitterness of beers and make a great alternative not commonly found at bars. For my drink selection, I choose two special release beers and one perennial favorite. I begin with the Alesmith Imperial Coffee Stout, a special release from the Miramar brewery. The beer pours an almost opaque black into the glass and has an aggressive dark tan head storming on top. The smell is captivating, grabbing your nose with dark chocolate, milky vanilla, and roasted coffee. The taste follows the nose with similar flavors jumping to the foreground. Dark roasted malts create the complex flavor. The ABV is nearly 12% and creeps into the finish, lending a spicy flavor. The next beer selection is a special release, the Stone Brewing Co. 15th Anniversary Black IPA. It pours a rich and full body, with a deep jet black hue and a vibrant khaki head. The lacing is strong, creating a beautiful pattern on the walls of the glass. The aroma is a very welcoming blend of high hop aroma and underlining bitterness. West Coast hops contribute to the high bitterness levels and the roasted malt level is very appropriately balanced. Overall, this is a wonderful example of a Black IPA; the style is represented well and reminds me of why establishments like the Tap Room are around, to provide great beers like this to beer fans. The final selection in my beer flight is the Black Marlin Porter, a perennial star from Ballast Point Brewery. The beer is on the thinner, lighter side, and is a great dark beer for a summer day. It pours black with dark mahogany tinges at the edges. There is a warm smokiness, coffee, and dark sweet chocolate in the nose. Dark bread and grains are the first taste and come off extremely smooth and fresh. An assertive dose of hops helps the beer finish with the bitter pine notes. The silky smooth texture and low carbonation help the beer remain “drinkable” on the warm afternoon. With my beer tastings underway, my dining partner and I have a chance to meet with the head chef. Chef Domenic Deluca cordially greets us and explains what his philosophy is for working at what is primarily a bar. He explains to us that it is a matter of meeting the expectations of what you would find at a bar, but changing the quality. Having come from a fine dining background, Chef Deluca uses as many fresh ingredients as possible. He has brought a Mediterranean-inspired menu to the bar and it proudly features pastas, pizzas, and subs. Meaty Lasagna, Chicken Parmesan, and a Greek Pizza that hosts feta, spinach, and roma tomatoes are great examples of what Chef Deluca brings to the bar. Additionally, he cooks up daily specials like Seafood Ravioli, Lobster Mac & Cheese, and Tiramisu made with stout from one of the local breweries. The bar is a great place to beat a hangover. Opening up at 10:00 a.m. on Saturdays and Sundays for breakfast, the bar serves generously sized omelets, breakfast burritos, and French toast. You can order traditional mimosas or the Tap Room variant made with your favorite wheat or pilsner. On Chef Deluca’s recommendation we start with the Beer Mac & Cheese. The heaping bowl of casserole style pasta is plenty for two people to share and comes topped with crispy bacon and sides of garlic bread. The Fusilli Rigati is nicely coated in rich cheddar and topped with toasted bread crumbs. Eating through the dish we find chunks of sweet Italian sausage providing the sweet and savory bite that balances the fatty cheese. 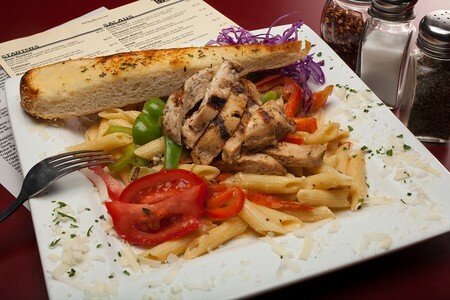 The garlic bread provided on the side is a nice accoutrement to the pasta. Topped with herbs and a little butter, the bread is a welcomed addition. The next dish we sample is the Apple Walnut Salad. A large bed of mixed greens on a circular white dish is topped with sliced granny smith apples, glazed walnuts, and dried cranberries. 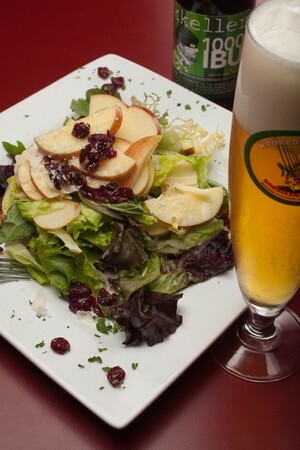 The salad is extremely well balanced between the tart apples, sweet cranberries, and salty shaved parmesan. The dressing is provided on the side: a light balsamic vinaigrette that pairs with salad nicely. The dish is extremely well thought out with no one component stealing the spotlight. The crunch of the walnuts finishes everything with a nice balance of texture and flavor. Still following Chef Deluca’s recommendations, we try a 14” hand-tossed pizza. We order half the pie topped with the BBQ Chicken and the other with the fresh Insalata. The Insalata Pizza is fairly simple; herbed mozzarella, pepperoni, and Roma tomatoes are cooked into the pie and then topped with a small salad of greens and tomatoes. Visually, the pizza is colorful with a nice contrast of greens, reds, and white. The pizza’s crust is a thin East Coast-style that holds up to the toppings well. The salad on top is tossed in Italian dressing and provides a nice burst of acidity to balance the salty cheese and pepperoni. The other half of the pizza is equally splendid. The BBQ Chicken Pizza is an alluring blend of red onions, cilantro, and mozzarella. The first bite reveals a tangy BBQ sauce, rich with savory Worcestershire and sweet brown sugar. The pizza finishes strong with creamy Gouda and the large chunks of grilled chicken. The classic combination pairs well with the Stone Black IPA. The grilled chicken and sauce both have a smokiness that matches that in the beer, while the hops cut through the spice from the red onions. 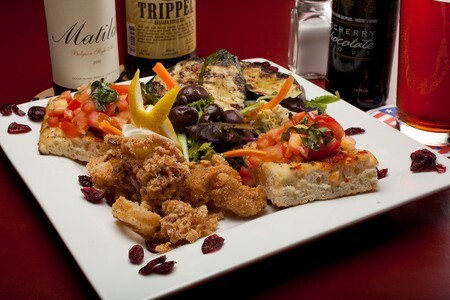 In addition, we try a sampler plate of appetizers from the Specials menu. The Sampler Trio is a combination of Bruschetta, Calamari, and Panko Crusted Zucchini, which can all be ordered individually if desired. The calamari and zucchini are both breaded and fried, and arrive steaming. A side of chilled marinara sauce is provided on the side to balance the warm salty coating. The dishes are both standard bar fare, but are prepared freshly. This is revealed in the strength of flavor that each has. The large zucchini slices take on an almost creamy texture when cooked this way and match well with the vibrant tomato sauce. The calamari is lightly breaded and tender, a treat to eat. The star of the dish though is the bruschetta. Warm, thick, herbed focaccia bread is topped with diced Roma tomatoes, garlic, basil, and olive oil. The bread is lightly toasted and baked with generous amount of fresh herbs. The bright tomatoes and basil cut through the warmth and balance the dish nicely. This is another dish that pairs incredibly well with almost any style of beer. A lighter wheat beer would be ideal, but the porter I select provides a nice contrast. The fresh garlic has a bite and spiciness that is countered by the mild hops. The thick yeasty bread is a natural pairing with the deep roasted malts in the beer. The dish is a great appetizer to snack on with almost any beer. My dining partner and I leave no room for dessert, but a few options are available for those with a sweet tooth. 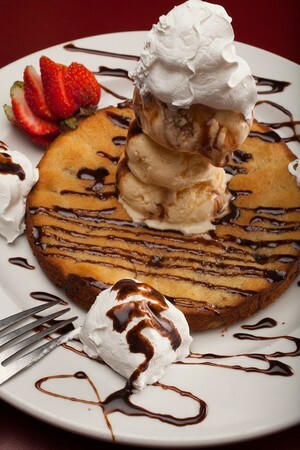 The restaurant prepares a few simple desserts like chocolate chip cookies, Italian cannolis, and bread pudding, which pairs well with almost any beer. The chef has also gotten creative using the available beers and regularly serves beer floats. Your choice of a hearty stout or porter poured from the tap over a scoop of vanilla ice cream would be an excellent way to finish a beer-inspired meal. 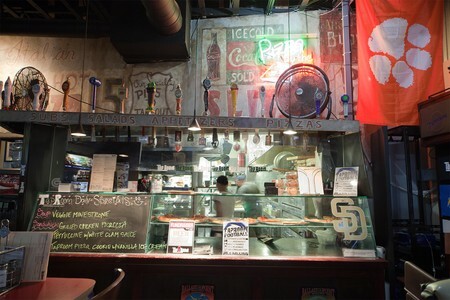 Choosing to avoid the typical frozen-then-fried fare, the SD Tap Room distinguishes itself from other bars and pubs. 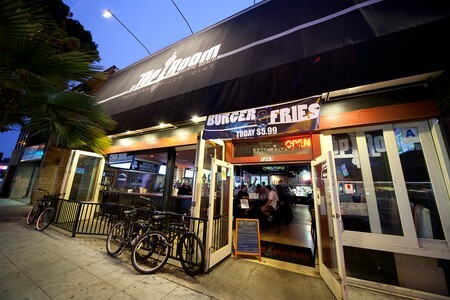 The owners truly want to be different from the surrounding bars while remaining true to the casual, easy-going southern California lifestyle. Tap Room’s commitment to serving high quality brews will attract most people to the Tap Room. However, you will soon find that the food is equally worthy of attention. Insider Tip: The best way to sample a variety of the great beers that the Tap Room serves is by ordering one of their beer flights. Six 6-ounce samples of your choice are served in a beer caddy. While it may seem like a lot, this equates to a little more than two beers and lets you pair many different types of beer to your meal. The Tap Room also has a hand-drawn cask beer on tap on at all times. Cask beers are only offered in a limited number of restaurants throughout the county and at select times, but you can find one here year-round. | All Day 11 a.m. - 11:45 p.m.
| All Day 8 a.m. - 11:45 p.m.
Saturday-Sunday: 8:00am-2:00pm. This is a sample menu only. Prices and availability may be subject to change. Monday-Sunday: 11:00am-Midnight. This is a sample menu only. Prices and availability may be subject to change. 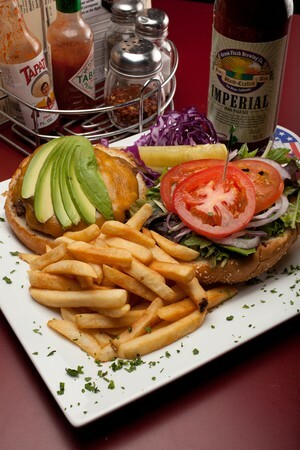 For Bacon, Cheese or Avocado: Add $1.00 Half pound Angus beef patty topped with lettuce, tomato, onions, and mayo.